"When he was at home, he'd undo the latches on the gates and let the other horses out. My girlfriend called him 'Marvel,'" Scott Sansom said of his 7-year-old Arabian gelding Riverwatch, that he'd sold part ownership to Heather and Jeremy Reynolds and Skip Lightfoot. "I said, 'Good! Then if he did something good, we could call him "Marvelous.''" If winning the 2011 Tevis Cup with Jeremy Reynolds aboard, and then clinching the Haggin Cup (Best Condition award) qualifies as good enough - then "Marvelous" he is. Scott got Riverwatch from his previous owners because of his - to put it lightly - feistiness. "That horse could buck!" Scott said. By Baywatch V (a grandson of Desperado V, by Huckleberry Bey) out of Dana Cheyenne (a great granddaughter of Huckleberry Bey), the 15.2-hand bay gelding started his endurance career at age 6 with Scott, completing 5 of 6 50-mile rides. This year, Riverwatch and Scott finished the 50-mile Shine and Shine Only in April in 2nd place, followed by a pull for lameness in May at the 75-mile Shine and Shine Only Ride. Around this time Reynolds Racing - Heather and Jeremy, and Skip Lightfoot - got involved. "I liked his build, and his attitude," Jeremy said. Scott sold part ownership to the Reynolds and Skip, and the Reynolds took over his training. Marvel's next ride was a first place finish and Best Condition award in the 75-mile Mendocino Magic ride with Heather aboard. And the rest is - Marvelous. 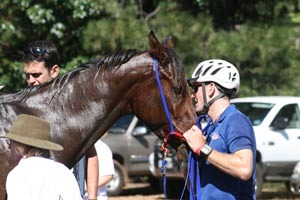 Jeremy and Marvel crossed the finish line of the 2011 Tevis Cup - Marvel's first 100-mile ride - in Auburn in 10 hours, 31 minutes, "with a lot of horse left," Jeremy said. 27 minutes later, Rachel Shackelford and BR Cody de Soi finished second, after riding at or near the front the entire ride. 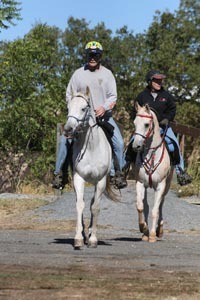 It was their second completion together on the Tevis trail, after finishing 50th in 2009. It was a marvelous and emotional ride for Rachel, as it was her 17-year-old gelding's final ride. Cody will be retired after this Tevis. One could, in fact, call a lot of things having to do with the 2011 Tevis Cup 'Marvelous,' not the least of which was pulling the ride off in the first place. 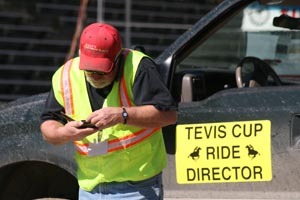 "It took us 16 months to prepare for this year's Tevis," said ride director Chuck Stalley, "and 24 hours to change it." The original date for the 2011 Tevis was July 16, but lingering record winter snow in the Sierra Nevadas prompted a postponement of the date. October 8th was eventually settled on, and a massive amount of work and volunteer hours went into maintaining and improving the trail, including widening the paths along some of the infamous cliffs that the horses and riders traverse. Come 60 hours before the start of the October 8 Tevis, however, an early and rather heavy winter snowstorm was still battering participants who had already arrived in the area. It became apparent that the Tevis could not go on as scheduled out of Robie Park. Some rigs were already stuck up at Robie, and at least 22" of snow had fallen in the high country over which the trail goes. Frantic conference calls amongst ride management were taking place. Their choices were: cancel the ride, have a controlled start for many miles out of Robie, make it a 50 mile ride, make it a 75 mile ride, or move the start to Auburn. The easy option was to cancel, but despite the most incredible work that would be required, the last was the most feasible choice. It is true that the ride would have taken a huge hit financially if it had been cancelled, but the real reason the ride went on was because nearly 200 riders had shown up and were scattered waiting up and down the I-80 corridor from Winnemucca, Nevada to Sacramento, California, hoping to ride the Tevis, after months (or years) planning for it. Thursday night at 6:15 PM, with 36 hours left till start time, ride management decided to move the start of the ride to Auburn. 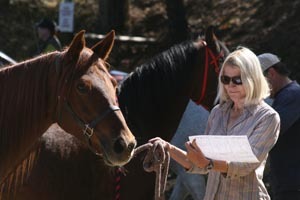 So began the massive reorganization and re-coordination of 700 volunteers, trail marking, water stops, sweep riders, communications people, and myriad other details required to get some 60 new (or in a new direction) miles of trail marked and made safe for nearly 200 horses and riders. Any decision sat well with 30-time Tevis finisher and legend Barbara White, who was in Auburn just to have fun one way or the other. "It's such beautiful weather - if they did cancel, I was just going to stay and ride around here anyway." 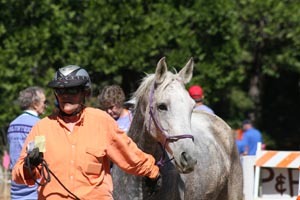 Barbara will admit that she is obsessed with the Tevis Cup ride, but she was just taking events as they came. As another rider put it, "If you call yourself an endurance rider and you can't go with the flow by now, you shouldn't be here." The "Non-Tevis Tevis," the "Mini Maxi Tevis," "The Tevis That Almost Was," the "Big Little Tevis": you could hear some dissing going on over the weekend about this year's 'easy' Tevis trail. Some went so far as to say this ride's finishers didn't deserve the real Tevis buckle - "maybe a smaller buckle." Wendell Robie, founder of the Tevis Cup, first held in 1955, would be turning in his grave in shame to hear that statement. But despite the change of location, and a possible 'easy' Tevis trail, 177 riders (198 had pre-entered) showed up to ride, really ride. It was still the Tevis Cup, with the same family atmosphere, the same anticipation, the same nerves, the same excitement; and the participants vetting in at the Auburn Fairgrounds on Friday were pretty excited to be there. 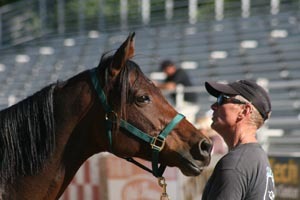 "It was Dayna's turn to ride this year," said Bruce Weary of his wife and her 9-year-old Arabian gelding, Maximum Heat. "This horse is durable, strong, has a great mind. "Dayna's dream is to finish in the Top 10 and show for BC before she dies." Michelle Rousch had been helping Dayna train and condition for this, and she was there to help crew during the ride. In his 3-season, 34-start record, "Max' has only one pull, and that was the Tevis last year. Dayna Rider Option-pulled him, while Bruce went on that year to earn his first buckle in 6 tries on John Henry. Max has 23 Top Ten finishes and 8 Best Condition awards to his credit - so finishing Top Ten in Tevis and showing for Best Condition was not a far fetched dream. 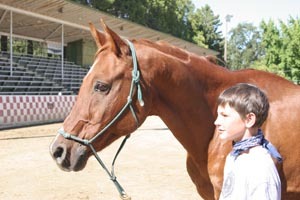 12-year-old Barrak Blakely was excited to be riding in his first Tevis with his mom Gabriela. He was one of seven Juniors riding. The trail change didn't diminish the excitement for any of the juniors, nor any of the 11 foreign riders from the UAE, Netherlands, South Africa, Australia, Canada, the UK, and Japan, who came to try their luck. Seiichi Hasumi from Japan would be attempting his 8th Tevis completion in a row. There were some 'foreign' horses, too - i.e. breeds other than the ubiquitous Arabian - a mule, a Friesian cross, a Paso Fino, a Missouri Foxtrotter, a Rocky Mountain horse, a Kentucky Mountain horse, a couple of National Show horses, Bashkir Curlies, and mustangs. A Norwegian Fjord showed up, gunning to purportedly be the first one to finish the Tevis. Brandy Ferganchick and "Dodger", from Colorado, mainly compete in North American Trail Ride Conference rides (long distance competitive trail rides), and this was their first 100-mile endurance ride. 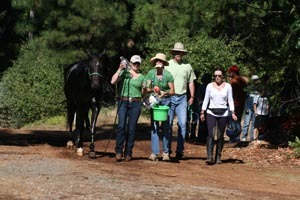 "He's good and competitive in NATRC," Brandy said, so they were here to attempt their first 100-mile ride at the Tevis. The Paso Fino came with another rider thrilled not to just be there, but to be riding Tomarius Juan Luis again, and to be able to walk without crutches. A relative newcomer to endurance, after starting on the trails in 2006, Melissa Margetts shattered her leg in an accident in the autumn of 2009. She was told she might not ever walk again, but by God she could climb in the saddle (with help), and a year later, she completed the Tevis in 2010 wearing a full-length leg brace and carrying a collapsible cane that she carried on the saddle with her. This year, Melissa still wore a leg brace but was walking without a crutch. "$130,000 in 3 surgeries, no health insurance, but I got the leg, and I'm riding!" she said cheerfully, because how else can you look at it? 18-year-old 'Cabo,' the first Paso Fino to finish Tevis, was going for his 4th straight buckle with Melissa. But she wasn't expecting an "easy" Tevis. Melissa said Cabo didn't have the downhills in the canyons to recover on - from Auburn to the first hour hold at Foresthill was just one long 38-mile haul uphill. She was a bit wary of that. It was a marvelous coincidence that Texan David Kaden was riding the Tevis for the first time. 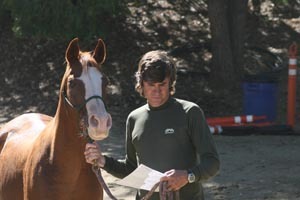 David's been riding endurance for 12 years, and has been involved in international competition - riding and leasing horses - but he'd never tried the Tevis. He happened to be in Auburn on Thursday meeting with his Specialized Saddle sales reps Bill and Lynn McKean in Auburn - David owns the company - when they offered him a horse to ride on the spur of the moment. David tried him out on Friday and decided to ride him. The usual start of Tevis at Robie Park is usually a somewhat exciting event. Horses are grouped into two 'pens' - the first pen being generally the riders that plan to go faster, and the second pen generally the slower riders. Once the trail is open and the pens of horses start moving, they all funnel from a wide forest service road to a 2-lane dirt road, to a 1-lane single track trail, 150-200 fresh horses raring to get moving down the trail at dawn. The start at Auburn was a bit different. There were no pens; only a big field to circulate around before the start was called. The faster riders hung right around the starting line and others positioned themselves where they could. There was, however, a controlled walking start. It was over pavement in the near-dark, and Roger Yohe and Red Sans Legend led the way at a walk for 3/4 of a mile before he pulled off to let the field go by. It was a bit difficult for some wound up fresh horses to keep at a walk for that distance. "I was one of those riders I hate!" 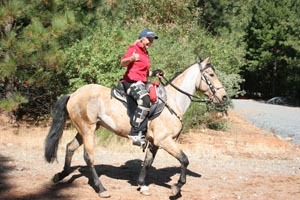 said Charisse Glenn, a 3-time Tevis finisher, riding Bogart VF in his seventh hundred-mile ride and his first Tevis. "He was crazy, going nuts at the controlled start, skittering sideways across the trail!" Horses had a trot-by check at the Lower Quarry at 10 miles, a Gate and Go ("Gate" is when pulse criteria is reached, then you can present your horse. Criteria must be met within 30 minutes of arrival. pulse criteria here was 60) at Francisco's at 20 miles, and the first hour hold at Foresthill at 38 miles. One horse was pulled at the Lower Quarry, and 6 pulled at Francisco's. The stretch of trail from Auburn to Foresthill - normally ridden the other direction, and ridden by most people in the dark - was a revelation to most riders. You see a lot more of the cliffs and steep drop-offs in the daytime! Some riders were... horrified... might be the proper word, even with all the work that went into widening the trail from 18" wide to 3 feet wide in place. Others were bowled over. "It was beautiful going the other way," said Kevin Myers, riding Auli Farwa (Far) on their second Tevis together. "Stunning." It was predicted that the front-runners would be at Francisco's in 4 hours, but Dennis Summers and OMR Tsunami (Lola) arrived sooner than that - at 10:12 AM. He was three minutes ahead of Jeremy Reynolds and Riverwatch, who was 5 minutes ahead of Rachel Shackelford and Cody de Soi. Those three would remain in the top ten all day, followed closely by the others who would finish in the top ten. Ten horses were eliminated at Foresthill. From Foresthill, the trail lead to Chickenhawk at 42 miles (no stop this first time through), then over the newly marked trail - an out-and-back road with a little loop at the end, with over a thousand feet of climb and descent. At Mosquito Ridge Road at 50 miles, Dennis and Lola held a 4-minute lead over Jeremy and Riverwatch, and Rachel and Cody; back at the Chickenhawk Gate and Go vet check (pulse criteria of 64) at 57 miles, it was still a very close race. Jeremy arrived with Dennis, both of them a minute ahead of Rachel. With Riverwatch recovering the fastest, he and Jeremy left a minute before Rachel and Cody, and 3 minutes before Dennis and Lola. The veterinarians were kept on their toes, as the next big group of riders was in a closely packed competitive bunch. 17 riders arrived in the next 18 minutes. Dayna Weary and Max arrived at Chickenhawk in 8th place and departed in 5th place. Garett and Lisa Ford departed Chickenhawk in 11th and 12th place. Garrett and Lisa finished 8th and 9th in last year's Tevis, with The Fury winning the Haggin Cup. They were riding the same horses again. 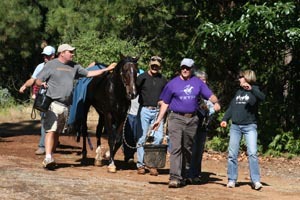 14 horses were eliminated at Chicken Hawk, including Charisee Glenn's Bogart VF. "I didn't like how he recovered at the last vet check, and he just wasn't right here, so I took a Rider Option." It was 4 miles back to Foresthill, at 61 miles, for the second hour hold. Jeremy and Dennis arrived together at 1:55 PM, a minute ahead of Rachel. It was Jeremy's horse Riverwatch who recovered first; they would leave Foresthill for the final 38 miles with a 1-minute lead over Rachel and Cody, and a 4-minute lead over Dennis and Lola. Shannon Constanti and Tally arrived in the next bunched group, and they might have arrived even sooner if Shannon hadn't stopped to help a distressed rider. "A man was riding in front of me who was sort of leaning over his horse. I asked him if he was alright, and he said 'I think I'm gonna....' and he fell off his horse!" She jumped off to help, grabbing her hot horse and his stallion, while another rider stopped to help the rider. She didn't know who he was, but he said he wasn't feeling well. He was apparently able to remount and continue on to Foresthill. Four horses pulled at the second Foresthill vet check, including Melissa Margetts' Paso Fino Cabo. "He didn't have those downhills after the steep climbs in the canyons to recover on - from Auburn to Foresthill this morning was just one long uphill. He got into Foresthill and just quit, like he was saying, ''I got you here and I'm not going any further.' I didn't feel it coming at all." Melissa said later that she'd probably retire Cabo. "He's 18. He's done a lot for me. He was my Once in a Lifetime horse - I can't post because of my leg and he's so smooth, I'll never have another like him." The last to arrive, and the last to leave Foresthill, some 5 hours behind the leaders, was Brandy Ferganchick and the Norwegian Fjord Fawn Creek Thor. They were in no hurry; they were 1 1/2 hours before the cut-off time. 'Dodger' was doing well and Brandy was in no rush to hurry him along. At Franciso's the second time through, a Gate and Go (pulse of 64) at 80 miles, Jeremy and Rachel arrived together, now 25 minutes ahead of Dennis and Lola, who had backed off the smoking pace. Carol Giles, helping to crew for both the Summers, (Sue Summers and 17-year-old AM Humvee - 'Hummer', one of the Bashkir Curlies - were crusing steadily along in 38th place on his first Tevis), said when Lola started feeling the downhills, he backed off. "He loves that mare!" 6 horses were pulled here, including South African Charles Currie, riding SMR Filouette, owned by Potato Richardson. Potato finished Tevis on the mare in 2009 and 2010 - for his 20th and 21st buckle - but it was not to be this year for Charles. Next was the ten miles to the Lower Quarry, at 90 miles, for the last Gate and Go (pulse of 64) before the final push to the finish line in Auburn. It's tough to make it this far and get pulled here. It happened to 8 horses, including Michel Bloch riding the oldest horse in the ride, AJ Rip Snorter. 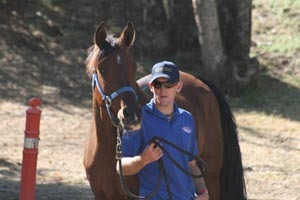 Michel and 24-year-old 'Monsieur Joseph' had finished 2nd in Tevis in 2003, were pulled in 2003 and 2004, and finished 4th in 2006 (he was pulled again in 2009 with Ann Bloch). Jeremy and Riverwatch were first in and out of the Lower Quarry, leaving with Rachel and Cody in hot pursuit just a minute behind. Dennis and Lola left 24 minutes later, followed 22 minutes later by a close group of Dayna Weary and Max, Leigh Bacco and EZ Silver Dollar, and Clydea Hastie and Frozen Assets (Pepe). Garrett and Lisa Ford left in 9th and 10th place. Some 5 hours behind the leaders, David Kaden and Samskrit lingered almost 30 minutes at the Lower Quarry - it wasn't yet midnight - and David was prolonging his Tevis adventure. "I was having a great time!" he said later, although early in the ride the pair had a little misadventure. "My horse wouldn't drink on the trail in the morning, so at one water trough, I stopped and got off him, and tried to make him drink. Other horses were coming and going on, and he just refused to drink, and he was getting mad, so I gave up and started to get on him. But I forgot what he could be like (he could bolt), and I didn't have the reins gathered, and he bolted with me half on his back. In 3 strides I fell off and the horse galloped off down the trail!" 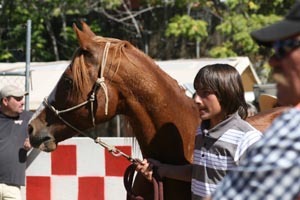 David ran after Samskrit on foot for a mile and a half, when he came upon Garrett Ford holding his horse. Lisa Ford had blocked the trail with her horse and Garrett caught Samskrit as he galloped up. "He'd passed 5 horses before we got him!" Garret said to David, "You run fast for an old guy!" "Garrett is The Man!" David said later - otherwise David might've had a looooon walk somewhere and not having the wonderful time he was having riding. Crossing No Hands Bridge around midnight, the bright near-full moon was like a spotlight reflecting off the American River. "I loved it - it was so incredible. I didn't want it to end!" The finish line in Auburn was set up a bit differently this year. The finish and final vet check used to be out on trail a half mile from the stadium. A small crowd of crew members gathered there waiting, and only after passing the vet check, the riders proceeded to the stadium where, rather anti-climactically, they re-mounted and took a final victory lap in the stadium, where a handful of fans and crew people waited. There were 3 people in the stands cheering me on when I finished in 2009. This year, there was an 'order-of-finish' finish line out on trail, where no crews were allowed (and where any sprints for the finish might take place over a safe stretch), but the official time and mileage did not stop till the riders continued to the Auburn stadium and passed under the finish line there. The final crewing and vetting would take place there - a much more viewable spot for everybody. 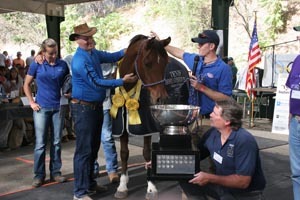 Jeremy Reynolds and Riverwatch won the 2011 Tevis Cup decisively, 27 minutes ahead of Rachel and Cody. Dennis and Lola came in third, 25 minutes later. A group of 4 arrived together next - Dayna Weary and Max, Garrett Ford and The Fury, Lisa Ford and Cyclone, and Clydea Hastie and Pepe, followed shortly by Shellie Hatfield on Splashes Maskrade (Elmo), and Bob Spoor on Logistic. It's heart wrenching to get pulled at the finish line. It happened to Lisa and Bob. 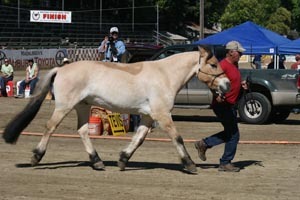 Three more horses were pulled at the finish later in the night, either for metabolics or lameness. All of that work by the horse to get 100 miles to the finish line - and not finish. 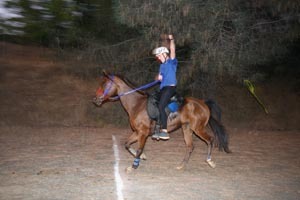 It's tough, but it's part of endurance riding, the thrills and the dashed dreams. There were great cheers for every single finisher that night, from first place Jeremy and Riverwatch, to the last place and 123rd place finishers, Brandy Ferganchick and the Norwegian Fjord Dodger. Roger Yohe's wife was there when Roger completed his 10th Tevis ride on Red Sans Legend (Roger swears he's done after this one; he and his horse fell off a cliff in 2007; his horse was fine, but he was rescued the next morning by helicopter with a number of broken bones); Debbie Lyon's husband was there when she completed her 10th Tevis ride on TCF Perfect Knight. Seiichi Hasumi's wife and entourage cheered for him as he completed his 8th Tevis in a row on TRT Cinnamon Rose, owned by Tinker Hart. 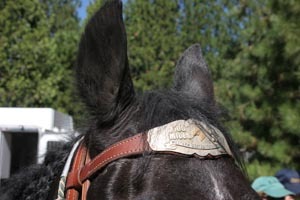 Connie Creech earned her 1000-mile buckle on LS Steel Breeze. Hal Hall earned his 28th buckle on Dreamm On. Pat Chappell finished on her Friesian cross Zoie Knightstar Nor for her 19th buckle. Kathie Perry, the President of the Tevis Cup, Board of Governors member, and Executive, and Ride Planning and Management Committee, had time after all that 24 hours of mad scrambling trail changing to squeeze in this year's Tevis ride in the saddle, finishing in 40th place aboard Echo Valley Hawk, for her 21st buckle. Junior Barrak Blakely was all smiles as he earned his first Tevis buckle on Twin Fir Victor in 21st place at 10:12 PM. (Mom Gabriela finished in 73rd place 3 1/2 hours later; she'd backed off to give her horse more time, and Hannah Pruss picked up his sponsorship and rode and finished with Barrak). Father-son duo of Paul and Anthony Rink, riding RR Traveler and PR Buddy, finished their first Tevis ride together in 50th and 51st place at 11:51 PM. Nick Warhol and Forever Dawn finished in 57th place at 12:27 AM, for Don's 4th straight Tevis buckle. "This horse is so much fun to ride!" Nick gushed over his horse, as he always does. It was Diana Hiiesalu-Bain's dream for 30 years to ride in the Tevis, and this year she rode and finished her first one, on her homebred Arabian gelding Khemali'i (Ali'i). Yes, we are crazy, this one big Tevis family, all of us focused on, centered around, obsessed with, and challenged by this 100-mile Sierra Nevada mountain 100-Miles-One-Day endurance ride started in 1955 by long distance riding visionary Wendell Robie. There was a lot of emotion in the atmosphere at the awards. There couldn't have been any dry eyes in the crowd as Barbara Bellamack's husband, who adopted a mile of trail in Barbara's name, spoke to the crowd. 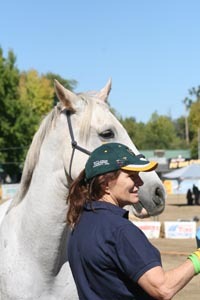 Barbara, a 10-time finisher of the Tevis Cup, passed away after a long aduous battle with cancer. Poppy Davis accepted the Dru Barner award (which is "presented with honor and gratitude to those who have contributed to and upheld the goals of the Western States Trail Foundation, and have helped maintain the integrity and dignity of the world-class event known around the globe as The Tevis") for her late mother Heather Davis. Even the veterinarian who announced the Haggin Cup winner was moved, as was the rider who accepted the award. 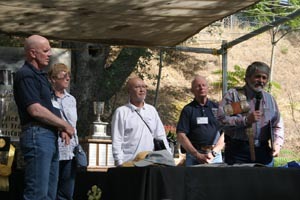 Head veterinarian Greg Fellers was proud of the 70% completion percentage accomplished this year, and his voice was near breaking when he announced the unanimous decision of the veterinarians in naming Riverwatch, ridden by Jeremy Reynolds as winner of this year's Haggin Cup. And even though he'd won the Tevis two times and the Haggin Cup once before, Jeremy had a hard time keeping his voice steady as he thanked everybody, including his horse and team, for their accomplishments this year. Nobody the day or the night before during the ride, or that day during the awards on Sunday, felt diminished in any way that they'd completed an 'easy' Tevis. It was a momentous undertaking that the participants - riders, crews, ride and vet staff, and volunteers - were proud to be a part of with their Tevis family. Because it is one big family, with this one marvelous big thing in common - this fabled 100-miles-in-one-day Tevis ride, which people from all around the world come to ride in, for the privilege to have the chance to say they completed the ride and earned a silver buckle. And they all deserved the Big silver Tevis buckle this year, for getting to the start, sticking around in despite weather, for rolling with the changes, for riding in the 56th Tevis Cup, and finishing this year in the ride that almost didn't happen. Awesome report Merri! Felt like I was there..
Great article Merri! You make living vicariously through the acts of others unforgetable! A wonderful accounting Merri. What a terrific gathering of so many details into a single coherent story. I was very sad Indy's torn ligament meant we had to miss Tevis 2011 and 2012 -- this report left me very happy for those who got to participate though. Thanks Yolanda, I didn't know that!